I got my iQ3 back today and a provisional inspection is that it looks perfect! All parts hit by the Mercedes had been replaced with new ones and it was completely repainted. It ran fine on the way from the garage to my work and back to my home again. It had just had a slightly delayed service and MOT too! Still it was a sad day for me too. I had become quite attached to the Aygo. It had a couple of features the iQ3 does not have which I found useful. It has a speed limiter. You can set it to any speed. I found this very useful to make sure I did not accidently creep over the speed limit and risk being prosecuted. It had a range remaining display. I particularly liked this when the fuel tank was low. When the fuel was low a little picture of a fuel pump appeared and I would then check the range remaining and know just how soon I needed to fill up. Once on the motorway I reckoned I could just get to the next plus one services. It got to 3 miles remaining with 3 miles to go to the services. Unfortunately it got to what would be 0 just before the services but actually displayed "Low Fuel" - so you get two warnings - first the fuel pump and then "Low Fuel"! I did manage to get to the pump OK. The iQ3 is still at the garage since the 1st October! I emailed them a couple of weeks ago saying I had booked it in for a service and MOT for the next week and they emailed me back it would be a couple more weeks and they would rearrange the service and MOT as necessary but I have not heard from them since. The Aygo is insured with no excess at no additional cost to me. I am completely used to it now and like it a lot. I have even had a holiday on the Isle of Wight in it! Over 4 tanks of fuel it is averaging 50mpg which is better than the 45mpg for my iQ3. Still the Mini Cooper sounds like it is a much better car than I have - maybe it is worth the £50 a week! Yes I definitely found the throttle too sensitive to begin with. 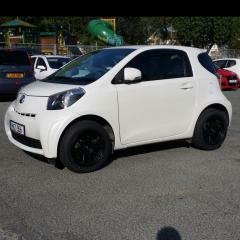 Now having driven the Aygo for 2 weeks I am getting used to it. I really like it accept that it is just not as quick off the mark as my iQ3 which only matters when you want to get away quickly onto a roundabout etc. Other than that quite important point I think I prefer the Aygo! Having refuelled twice now Fuelly claims I have got 56.1 mpg, far better than the overhaul 45 mpg average of my iQ3. I may fit in another fill up before my iQ3 is back in operation and so I will see if I get a consistent figure next time. After today's trip to the coast along motorways and A roads I can say in general I like it. The gearbox is quite slick and it is powerful enough. The only real disadvantage over the iQ3 is pulling off at roundabouts. I needed to leave a bigger gap with oncoming traffic than the iQ3. I found it difficult to make it go off the mark quickly without over revving the engine a little so it was a bit noisy whereas I can get the iQ3 going quickly off the mark with little fuss. It may be just a matter of getting used to it though. If I was just patient and waited for a big gap and set off slowly there was no problem. Thank you. Here is my replacement vehicle. I have been driving it all week and it seems fine. Today I gave it a good clean inside and out and tomorrow my wife and I are off to the coast in it. I shall see how it compares with the iQ3 on a long run! I took my car in for its remedial work on Monday and on the way got hit by a Mercedes! So now the car is in for the free remedial work, accident repair and I have authorised £401.06 to repaint the painted plastic which is not covered by the free remedial work so I will end up with a totally repainted car. It was a strange accident. The route to the Toyota garage takes me through a roundabout which has two lanes inside it and four exits. I needed the third which is practically straight on and tracked round it in the left hand lane only to be hit at the second exit by someone who I imagine thought I was going to take that second exit despite the fact I had my right indicator on to try and make clear I did not intend do take it! I went though the whole scenario with my insurance company and they agree I am not at fault so we will see what happens with the claim. I also walked to the roundabout one lunch time and inspected the traffic flow. My intended route was quit commonly used. I hope not to lose my nine year no claims bonus! 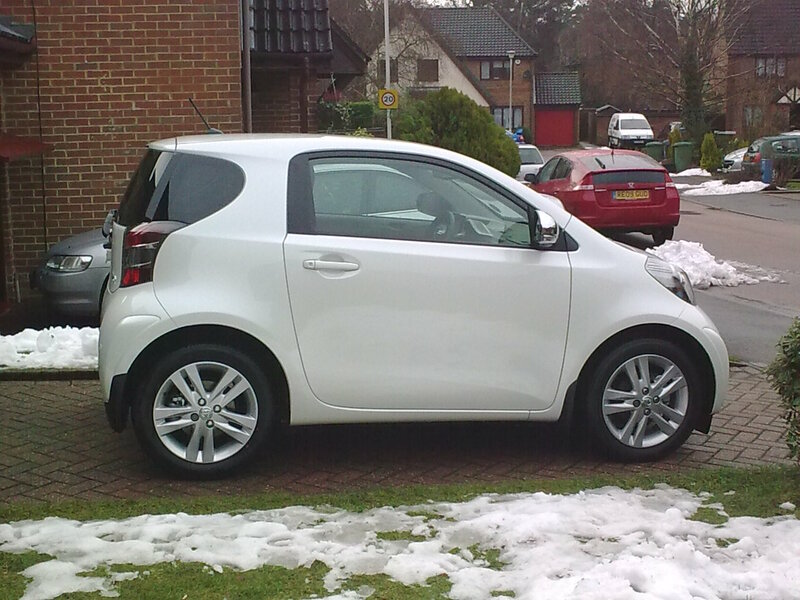 I am running around in a brand new but very basic Aygo lent to me by the garage now. I attach some pictures. The bonnet is getting worse! There is no sign of pealing elsewhere but it is just a matter of time. Toyota have authorised the repainting of all pearl white paint on metal. The pearl white paint on plastic will not have a problem. I may see how much they would charge me to repaint that too. I will get it done if it is not a huge price and then the whole car will be repainted! It is very mysterious. It only affects my bonnet. I have never had a car with a bonnet with so much paint coming off before. The rest of the paint work is fine. Because it is pearl white I am worried I have the well know pearl white pealing problem. On the other hand it appears not to be as bad as that. I will see what Toyota say in a few weeks. A report by the garage has been submitted. Yes I was aware of them. That is why I was so worried! Yes mine is a 2009 model. The problem has only just started and only affects the bonnet at the moment but I am obviously concerned it will spread. I will see what Toyota say - it may take a fortnight. It is almost 8 years old and it has not been repainted. The problem only affects the bonnet at the moment but I am concerned it may spread. The damage looks nothing like usual stone chip damage. I have a pearl white iQ3. Recently I noticed paint coming off on the bonnet. I was alarmed. I had previously heard that pearl white iQs can have this problem and much worse than for me! I took it to the main dealer and they checked it. They are submitting a report to Toyota. I may end up with most of the car being repainted! Apparently it is just some mysterious problem that affects pearl white iQs. My problems are minor though at the moment - possibly because it was protected with Supaguard when new and I top up the protection with their polish from time to time. The person at the garage said whole swathes of the paint can come off - particularly so on the roof. I have a service contract for £18.63 a month which pays for an annual service and MOT. They may suggest additional cost items at the service though - for example brake pads when necessary. A few years ago though I decided they did not change my air conditioning filter often enough so for the past few years halfway between services I fit an new air conditioning filter myself and also clean out the air conditioning system with Comma air conditioning cleaner. My iQ3 did not use very much oil for its first 60,000 miles. Now it is needing a top-up between services to keep the oil over the low mark. It is at 70,000 now. It is about three quarters the way to its next service and in total I have put 1.25 litres of oil in since its last service to get the level back to max. It always used a little between services before but not enough to necessitate topping up to keep the level above low - it would drop from about full to half way between full and low between services at the worst. When it was brand new the coolant level went down by a cm in the reservoir which I topped up with Toyota pre-mixed coolant but since then it has never been off the max mark at all even at 70,000 miles! I like to keep my eye on the coolant level because a drop could be a sign of something like the water pump needing replacing - something well worth catching early to avoid a catastrophe. I have a car allowance from work and have to fill in an assessment each year. As well as having to answer yes/no to what I do at the moment you have to answer yes/no to checking all the lights before every trip! I answer no to that one with an explanation as to why it is a bit OTT. My manager counter signs the form and never complains about what I write. After all he has to fill in the same form himself! One question I remember was "Do you carry anything dangerous". I answered "yes" with an explanation it was petrol in the fuel tank! Everyone in the department had a good laugh about that! Yes it is not a very good photograph. I should have shown just the ends of the two dipsticks. Then what happened would have been clearer.